Ludlow, my new fabric collection from FreeSpirit Fabric, is inspired by the old mill towns of New England where I grew up. Housed in small red-brick buildings situated on rivers, with the ubiquitous triple-decker factory housing dotting the landscape nearby, the mills informed the culture and community of the towns that developed around them. Ludlow pays homage to the millworkers, their labor, and their contribution to their community. 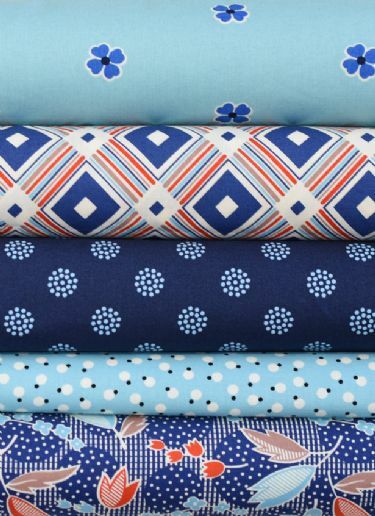 With medium and small-scale geometrics and florals in a range of textures and values, the 19 SKU's of Ludlow in Dogwood and Forget Me Not are perfect for old-time quilts, pretty aprons and factory dresses. Coming soon, a new quilt pattern to showcase Ludlow, called Woven! Browse the Ludlow Lookbook on FreeSpirit, or here.